. 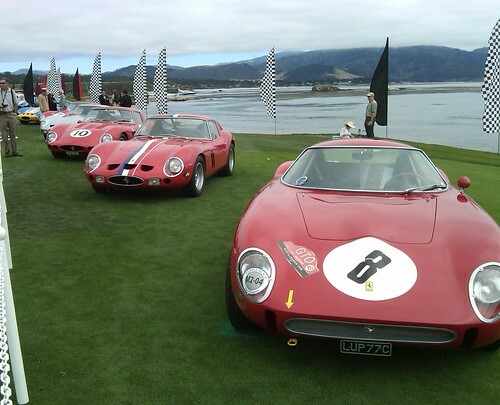 The grand finale and main event of the week culminates during Sunday&apos;s Concours d&apos;Elegance at Pebble Beach. For a full list of shows, races and auctions click here. The inaugural World Class Automotive Film & Arts Festival takes place at the Golden Bough Theatre in Monterey this weekend. The event mixes all things auto with visual, auditory and written arts. Thursday-Saturday, 417 Alvarado Street, Monterey. $20 per day. "Art Meets Cars" this weekend at Trio Carmel in light of Monterey Auto Week. Various art pieces that highlight automobiles from Concours d&apos;Elegance will be on the walls while you taste olive oils, vinegars and wines. Friday-Sunday from 11am to 6pm, Dolores between Ocean and 7th, Carmel-by-the-Sea. Free admission. Prepare to LOL at Planet Gemini as comedian Geoff Brown takes the stage. His numerous television appearances include NBC&apos;s Spy TV, UPN&apos;s Girlfriends and most recently seen as one of the stars on NBC&apos;s Last Comic Standing. Stay for karaoke or the After Party where local DJs mix up the latest hits. Friday and Saturday from 8pm-1:30am, 2110 Fremont Street, Monterey. $10. Bring your kiddos to MY Museum and for an afternoon of making tracks. Today kids will learn how to distinguish footprints from some of Monterey&apos;s furry and feathered friends. 3:30pm-4:30pm, 425 Washington Street, Monterey. Free with museum admission. For a night full of food, wine and live music head to the Carmel Plaza. Tonight&apos;s Summer Live Music Series features live music from Red Beans and Rice, food from Bistro Beaujolais and wine from Hahn Family Wines. 5pm-7pm, Ocean Avenue and Mission Street, Carmel-by-the-Sea. Watch and listen to photographer Craig Lovell as he goes through a presentation highlighting several festivals of San Miguel, Mexico at the National Steinbeck Center tonight. He will take you on a visual adventure to the Easter Procession, Day of the Dead and Independence Day, three of the most heartfelt and joyous celebrations in Mexico. 5:30pm-7pm, One Main Street, Salinas. Free admission. Loveline co-hosts Adam Carolla and Dr. Drew stop by the Sunset Center in Carmel-by-the-Sea this evening for a night full of laughs. The duo will reminisce on some of their stories from their show while interacting with the audience. 8pm, San Carlos at Ninth, Carmel-by-the-Sea. $59. Rise and shine for a hike through Del Rey Oaks&apos; Frog Pond this morning. Guides from the Monterey Peninsula Regional Parks District take hikers on a 2 hour nature hike along the wetland scoping out the unique wildlife and their habitat. Don&apos;t forget to bring water and snacks and to wear comfortable shoes. 9am, Del Rey Oaks. Free admission. Gary Meek and Friends play at the Monterey Bay Aquarium tonight during Evenings by the Bay. This event is a great way to enjoy live jazz music, light refreshments at the incredible exhibits by night. 6pm-8pm, 886 Cannery Row, Monterey. Free with aquarium admission. The grand finale of Monterey Auto Week takes place today! Only 200 of the finest classic cars are allowed on the 18th fairway at The Pebble Beach Golf Links during Concours d&apos;Elegance. This year&apos;s event will feature Mercedes-Benz, Stutz, Rolls-Royce Silver Ghosts, Ferrari 250 GTO and Italian motorcycles. 10:30am, 1700 17 Mile Drive, Pebble Beach. $225 in advance and $275 on day of show. Escape to the Big Sur River Inn today for an afternoon of live music. Along Came Betty plays jazz tunes out on the deck to help you relax and rejuvenate before the work week. 1pm, 46840 Highway One, Big Sur. Free event. Evenings by the Bay features live music from Kenny Stahl at the Monterey Bay Aquarium tonight. 6pm-8pm, 886 Cannery Row, Monterey. Free with aquarium admission.